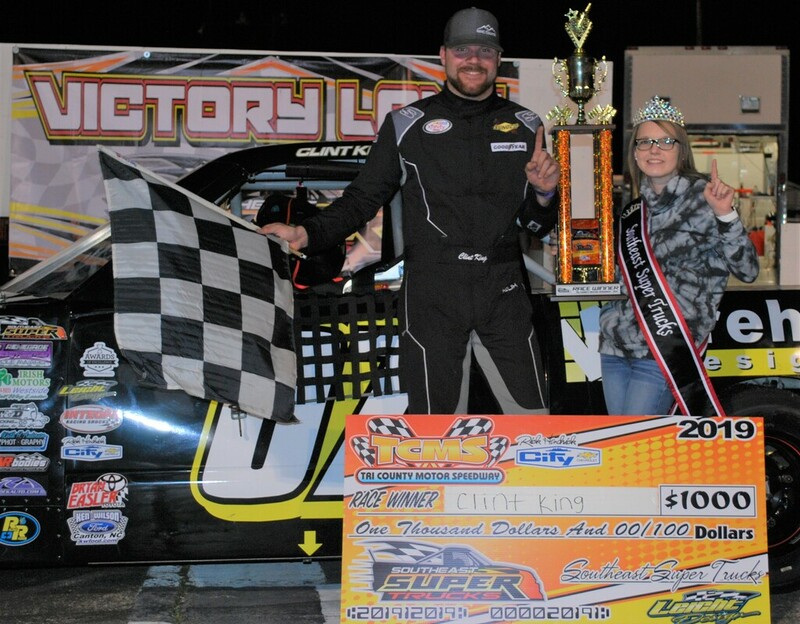 HUDSON, NC -- The 2019 season finally kicked off this past Saturday night at Tri-County Motor Speedway. There was several new faces around the garage area, and on track. Your past Champion Kenneth Headen returned to fight off the tough competition. As the staff and teams arrived in the foothills of North Carolina, the adrenaline kicked in. Fifteen of the best short track drivers showed up to knock each other off and out of the way. From a few new rookies Jack Galunke, Brett Suggs, and Clark Houston to the Veterans of the series. This race shaped up to be a barn burner. Ralph Carnes claimed the Renegade Race Fuel & Oils Pole Award, he went on to roll a five on the invert dice. As the Southeast Super Truck Series Presented by Rick Hendrick City Chevrolet race drew closer, the drivers went into their race modes. Ed Surrett started the race in the top spot, with Clint King starting on his outside. The green flag flew, and Clint took off like a missle. After a few laps, Headen began to apply pressure to King's rear bumper. The field crossed the half way mark of the race, going all green flag laps racing side by side. King and Headen began to catch some slower traffic to put them a lap down, when the #20 machine of Roberts made contact with Headen in turn two. Roberts had been fighting a ill handling truck all night and tried to hold on to it. Houston and Carnes took advantage of the incident and moved past Headen. The top four were nose to tail all the way to the finish. King held off Carnes, Houston, and Headen every lap and went on to capture his first ever Southeast Super Truck victory. "Oh man this is awesome, I have been wanting to win in this series for a long time. Hard to believe this twenty year old truck is still this good." said a happy King in victory lane. Ralph Carnes (who raced double duty and won the SEST Limited Late Model feature) came home second, followed by Houston in third, Headen in fourth and past Hickory Motor Speedway Super Truck Champion Sheflon Clay rounding out the top five. The Series will make a stop at Anderson Motor Speedway on April 20th. Other divisions racing that night will be SEST Limiteds, RPM Pro-Formance Southeast Legends Tour Presented by LJ Dezigns, and the Newport FWD. Stay tuned to all the latest news and information by visiting our website www.southeastsupertrucks.com or our Social Media Sites.